Having learned that tough lesson about ideas, I started pushing off. That’s painful, you know. Any project or endeavor that’s worthwhile scabs up your knees and/or rubs your brain a bit raw. Probably why there’s so much landfill filler. Seems less painful just to halt and lower expectations of yourself, but I try hard not to let that happen. Maybe it causes me to work longer on something that’s good enough already, but I prefer that to summarizing my work as “good enough”. I’ve come to a point in my life where ideas and ability aren’t a problem. Now, the problem is time. In order to support yourself and your family while you learn all these lessons you might make the choice to work at something you’re good at rather than doing what thrills you. If so, you’re a bit like me. The agony now is that I can identify good ideas, I’ve worked through honing my skills, but I need to force in the time to make the giant transition. So now it’s go time. Yep, it’s been go time for half a year. Working betwixt the paying job hours and the family time is getting me to the point… slowly. One of the first big leaps is an iPhone game involving a bitty living snowball with eyes. My business has got a name, now, too. 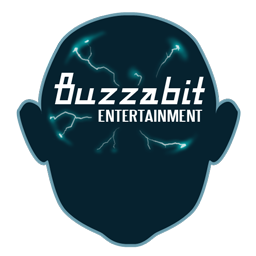 Buzzabit Entertainment. That’s a first draft of the logo in the corner. Soon (keep in mind the time thing), there will be much more to share. This entry was posted on Sunday, January 18th, 2009 at 7:54 pm	and is filed under Blog, Business. You can follow any responses to this entry through the RSS 2.0 feed. You can leave a response, or trackback from your own site.